Aculon® repellency treatment technology bonds with many different surfaces at the nanoscale to create easy-clean water and easy-clean anti-smudge coatings. Aculon specializes in superhydrophobic (water-repelling) and oleophobic (oil-repelling) nanotreatments that are easy to apply. Call us now at 858-350-9499 or click the request for information buttons below to learn more about Aculon’s repellent treatments and coatings. Aculon’s hydrophobic and superhydrophobic coating treatments bond with many different surfaces at the nanoscale to create easy-clean, water-repelling, anti-smudge coatings. These hydrophobic coating treatments are used for eyeglasses and other surfaces, such as flat-panel displays, and stainless steel. Aculon’s nanoscale hydrophobic coating treatments create surfaces that repels water, dust, oil and dirt, allowing for easy-clean glass and easy-clean metal. 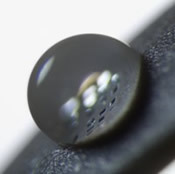 Many of Aculon’s superhydrophobic treatments also have oleophobic properties. Call us today at 858-350-9499 or click below to request information or read more about Aculon’s hydrophobic coatings. Aculon’s oleophobic coating treatments create an oil-repellant surface to repel water, dust, oil, and dirt on surfaces. Aculon’s oleophobic coating treatments bond with many different surfaces at the nano-scale to create easy-clean, water and oil resistant, anti-smudge coatings. allowing for easy-clean glass and easy-clean metal. Aculon’s innovative oleophobic coating technology is extremely easy to apply through many different methods, requiring no costly capitol equipment. Call us now at +1-858-350-9499 or click below to request information or read more about Aculon’s oleophobic coatings. Aculon supplies easy-to-apply OEM and consumer-applied easy-clean and non-stick treatments for a range of applications, including consumer goods, industrial equipment and electronics. Call us today at 858-350-9499 or click below to request information or read more about Aculon’s non-stick and easy-clean coatings.